Thank you to all those that came to the first gun law seminar of the month that Rep. Jeff Wheeland and I hosted. The last two seminars will be held Tuesday, Oct. 23, at Old Lycoming Township Volunteer Fire Co., and Wednesday, Oct. 24, at Hughesville Volunteer Fire Co. 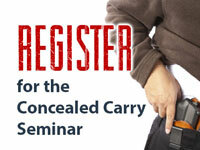 If you haven’t already signed up for one of the last two seminars, please click here to register. The informative events include presentations from Lycoming County Judge Marc Lovecchio, who will discuss Pennsylvania’s Castle Doctrine and Stand Your Ground laws; Lycoming County Sheriff Mark Lusk, who will explain rules and regulations surrounding licenses to carry firearms; a police officer, who will discuss how to safely interact with the police when carrying a firearm; and an officer from the Pennsylvania Game Commission, who will discuss firearm carry laws as they relate to hunting seasons. Seating is limited, and advance registration is required. To RSVP, click here, or contact the district office by calling (570) 398-4476 or emailing Kathy Koch at kkoch@pahousegop.com. Long-term lane restrictions remain in effect at a resurfacing project on Interstate 180 in Lycoming County. There will be alternating lane restrictions on I-180 in both directions from the Muncy Creek bridge at Mile 14 (between Hughesville and Pennsdale) to the Carpenter’s Run bridge at Mile 16 (between Pennsdale and the Lycoming Mall Interchange). Motorists can check conditions on more than 40,000 roadway miles by visiting 511PA.com. 511PA, which is free and available 24 hours a day, provides traffic delay warnings, weather forecasts, traffic speed information and access to more than 860 traffic cameras. PennDOT has also announced that an emergency temporary repair project is has begun at a slide that has closed Route 87 since mid-September near the Village of Barbours in Lycoming County. The slide is located just north of Route 1007 (Dunwoody Road) in Plunketts Creek Township. This work is anticipated to be completed and the road open to one lane of traffic controlled by temporary traffic signals by Thanksgiving. Until then, a detour using Interstate 180, Route 220 and Route 154 will remain in place. Flooding in the area since late July eroded the slope that supported the roadway, making this section of Route 87 unstable and unsafe for motorists. Groundwater levels have also increased, adding to the instability of the slope. If you are a veteran or a family member of one, I encourage you to take advantage of free assistance at my local office in Muncy. Dan Falls, department service officer with the Pennsylvania American Legion, will be available by appointment on Tuesday, Oct. 23, from 9:30 a.m. to 2:30 p.m., to help with issues such as compensation, pension, death benefits, education, health care and general veterans’ benefits. Veterans do not need to be a member of the legion to participate. To schedule an appointment, call my district office at (570) 546-2084. If you can’t make it in October, service hours will be available on the fourth Tuesday of each month, with the exception of December when the hours will be held on Thursday, Dec. 27. The Muncy office is located in Penn Hills Plaza, 21 Kristi Road, Suite 1. This week, the House Insurance Committee held an informational meeting to learn more about legislation to help ensure the viability of rural hospitals across the state. House Bill 2532 would establish the Rural Health Redesign Center, a public-private partnership, which would administer the PA Rural Health Program. This would help strengthen rural hospitals, keep jobs local and increase access to health care. Currently, rural hospitals are paid in an unpredictable, fee-for-service manner that leaves many facilities suffering financially. Through the program, rural hospitals would transition to a payment model that would provide a stable and steady stream of revenue, allowing these vital health care facilities to better plan the types of health services their communities need. About 67 hospitals in Pennsylvania are considered rural, and 32 of them are at risk of closure with operating margins below 0 percent. This public-private partnership is an opportunity for these hospitals to get on some stable financial ground. These hospitals – which provide critical access to care for thousands of rural residents -- and their employees are the economic engines of most communities, and it’s imperative to keep them operational. This week, the House unanimously passed my resolution that designates the month of November 2018 as “Infant Safe Sleep Month” in Pennsylvania. The U.S. Centers for Disease Control has said there are about 3,500 sleep-related deaths among American babies each year. To combat this, the American Academy of Pediatrics Task Force released a report recommending infants be placed on their backs for sleep, and that the safest environment for sleep consists of babies sleeping alone in an empty crib with a tightly fitted sheet and sufficient sleepwear. House Resolution 1156 ensures the Commonwealth is providing families and daycare providers with the greatest amount of information to help prevent unnecessary infant deaths. I have worked together with Lycoming County Coroner Chuck Kiessling for several years on raising awareness about safe sleep practices for infants, and we are happy to see this resolution approved. Because of our efforts to spread the word about the Cribs for Kids program, Coroner Kiessling has told me that we have seen a drop in the number of infant deaths from unsafe sleep environments in Lycoming County. You can find The Academy of Pediatrics recommendations for Safe Sleep for Babies here. House Republicans successfully fought for the passage of Legislation that aims to have Pennsylvania’s debt payed back more responsibly. House Bill 83 is now being considered by the governor. This legislation will require the principal for new issuances of state debt to be repaid in equal amounts over the (generally) 20-year term of the bond. Currently, the state uses a repayment scheme with lower principal payments in the first few years, with much higher principal payments as the loan matures. This forces difficult budgeting decisions farther into the future. The legislation will require the Commonwealth to use the more responsible, Equal Annual Maturities Plan method on all new debt obligations incurred under the Capital Facilities Debt Enabling Act. This simple change will reduce the debt we pass on to future generations and end one of the “buy it now, pay for it (much) later” policies that have been negatively impacting Pennsylvania’s credit rating for years. With a recent study published by the Cato Institute giving the governor an F rating on fiscal responsibility, this legislation is ever-more pressing and would allow Pennsylvania to partake in the nationwide economic revival. Legislation to expand eligibility for the state’s PACENET prescription drug coverage program passed the House last week and is moving through the state Senate. Up to 17,000 Pennsylvania seniors are expected to benefit from this expansion.